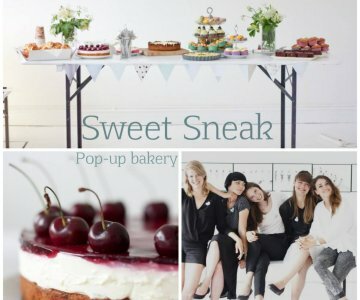 Calling all cake lovers in Copenhagen – Sweet Sneak #7 is this Saturday! I saw a photo of an ice cream dessert with tiny meringue kisses sprinkled on top and thought that it looked really cute. So I wanted to make my own little batch of meringue kisses so I have them ready for a dessert. 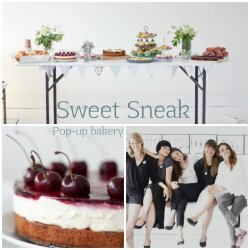 Easter is around the corner and we have a few dinner parties planned, so these little kisses will come in handy. I decided to add a bit of colour to them and a little taste too. They are very easy to make, you just need a bit of time on your hands, first for the baking part and then for the drying out process. Whisk your egg whites to soft peeks and then add the sugar, a tablespoon at a time. When 1/2 of the sugar has been added, add the vanilla extract. Continue beating and adding remaining sugar in batches, until all of the sugar is dissolved and the meringue is very shiny and tight. Divide the meringue into three (or however many different colours/flavors you want to make) small bowls and add colour and extract, mix well and pour into piping bags with a small star nozzle and pipe onto a baking tray lined with greaseproof papir. Bake for about an hour and a half. But keep your eye on the meringue – with out opening the oven too much as the meringue might collapse if you do. When they are done, turn the oven off and let the meringue kisses dry completely in the oven.